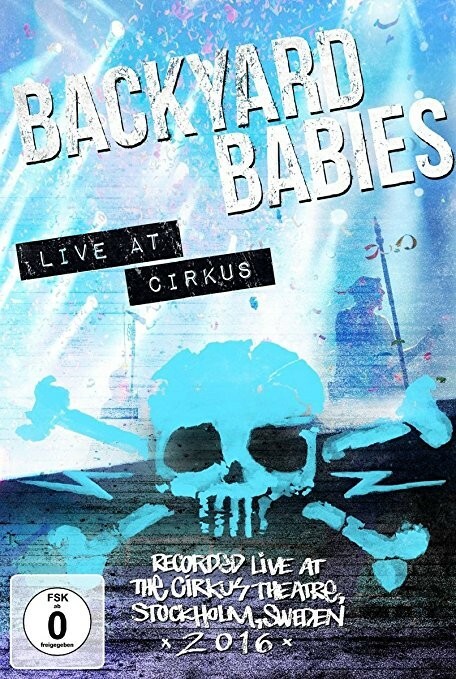 This is a well-produced and traditionally shot live video of Backyard Babies from a gig in Stockholm on 10th February 2016. There's plenty of camera angles – front, reverse, above behind – providing an all-round view of everything happening on stage, including close ups of their facial expressions. The sound is also excellent throughout. Perhaps to be expected, there's lot of strobing, the light can be dim and sometimes the band are in silhouette, but it's possible to see what is going on most of the time. They keep it short and sweet at about an hour, a good choice in my view as it keeps people wanting more. Apart from a brief backstage shot at the beginning, it's the concert short and simple with no frills. The set-list is well chosen with a good mix of new and old, starting off with the excellent recent track 'Th1rt3en Or Nothing', one of their best tracks getting things off to a great start. Of course, there's plenty of older songs like 'Brand New Hate', 'Dysfunctional Professional', 'Look At You' and crowd favourites like 'Minus Celsius'. The vocals are particularly clear with almost all the lyrics being audible which is one big advantage of a DVD over a live gig. There's a real sound to everything; it doesn't appear overdubbed and where the crowd can't be heard on a sing-along, they leave that in and don't try to fake it which was nice to see. Another highlight is the alternatively Rock 'n' Roll, alternatively soulful Bluesy guitar from Dregen with his Hanoi Rocks style drunken swagger and demented Wee Willie Winkie appearance. Part of being at a gig is the participation, getting sweaty, being in a crowd and being deafened by the speakers, especially with a Punk/Sleaze Rock band like Backyard Babies. From that point of view, maybe DVDs are for fanatical followers of bands only. Irrespective, this was enjoyable. Minor niggles include no subtitles on all the introductions to songs which were unsurprisingly in Swedish, and only close ups on pretty girls (while we expect this of David Coverdale, perhaps we thought Backyard Babies were a little greasier in their approach to their fans – surely there were a lot of men in attendance and maybe a few might have looked cool enough to shoot). These are all minor gripes in the grand scheme of things when it comes to this polished production.